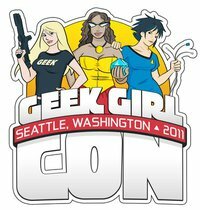 Recently I attended Geek Girl Con, a brand new convention taking place in Seattle, celebrating the female geek. The con was very content heavy, and much smaller than PAX - a very different experience for me. The bottom line is, I loved it! I got there a little late the first day and missed out on one of the panels I was interested in, which was sad. After picking up my badge, I met up with a friend of mine and we browsed the exhibit hall. After that, we went to a panel on Feminism, Race, and Geek Culture. The panelists included Regina Buenobra (moderator), Michelle Hu, Nina V. Reyes, and Christina Xu. The panel was interesting and brought up some awesome ideas for broaching difficult subjects such as race and gender issues in online communities. My favorite was the idea of presenting these issues in ragecomics. Another interesting point brought up was the problems of cross race roleplaying and how it can sometimes help proliferate stereotypes. Michelle is a friend of the person I was attending the con with, so after the panel, my friend and I went to lunch with the panelists and a few other people - including a writer for ArenaNet currently working on Guild Wars 2, and a lovely woman who writes and edits for Border House under the pseudonym Quinnae Moongazer. The lunch was awesome, and it was really cool to be able to say I had lunch with people from ArenaNet. After that, I browsed the exhibit hall some more and picked up two purchases. The first was purely for nostalgia trip reasons - I grabbed Pokemon Snap for three dollars at a used game stall. I don't even have my N64 right now, it's at my parents' house, but I'm going to have them bring it up to me - emulation is grand and all but it's just not the same. My second purchase has already gotten me a bunch of jealousy from my friends - my cactuar. I decided instead of getting a shirt, which I have way too many of, I'd spend the same amount of money on something that makes me squee in delight. So, small stuffed cactus it is. I also really wanted a goomba hat but by the time I came back with cash, it was already bought. Probably just as well. Next up was The Designing Women of Bioware. It was awesome to be in the same room with the minds behind much of Mass Effect, Dragon Age, and KotOR. Their stories provided great insights into the operation of a game company. I noticed many of the level designers got their starts at Bioware as interns, and I'm a little concerned that I won't have that option available to me as there are no video game dev studios in my area. Despite this, I came out of the panel excited and inspired. Sunday had one of the panels I was most looking forward to: Girls Make Games Too, which was about women getting into the gaming industry. I was a little disappointed that most of the people on the panel were on the art side of things, but there was one gameplay engineer as well as a team lead - in fact, THE team lead for Portal 1! The gals had some awesome advice for people getting into the gaming industry. They said they hadn't ever experienced blatant sexism, but there was a lot of unintentional separation that they'd had to break down. Often when a woman comes on to an all-male team, the boys worry that she'll ruin their culture, that they won't be able to joke around the same way or tell raunchy stories. 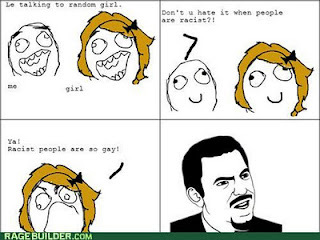 Without any exceptions, the girls at the panel dealt with this the same way: be more raunchy than the boys. One mentioned that the first thing she did when coming into a new team was to crack a dirty joke. Another said she always makes sure to drop a "tactful" f-bomb during the interview. That sort of blew my mind, and jolted me into the reality that I'm in a creative industry now, not the dry boredom of typical engineering jobs. Almost all of the girls had tattoos and piercings in visible places. They dressed casually and stylishly, not in button up shirts and slacks. These are my people, this is where I want to work, and I'm just so excited to be getting started in this industry. The last event I attended at the con was a spontaneous jam of three nerdy bands just outside the main conference area. They same some original nerd-feminist themed music, then had a sing-along for Birdhouse in Your Soul and Still Alive. It was an awesome note to end on, since I couldn't stay for the closing ceremonies. Overall this con was a great jolt of inspiration for me, not only as a girl gamer but as someone who hopes to make games. The camaraderie and heartfelt support was palpable, and the issues discussed were thought provoking and important. It was a great start to an awesome new tradition, and I don't have any doubt that it will be continuing next year. Life of Jiya: What Free Time?